Hogsback is a town in the Eastern Cape of South Africa. Fly to East London, rent a car and drive the 140km via King William's Town to Hogsback. Fly to Port Elizabeth, rent a car and drive 250 km via Grahamstown, Fort Beaufort and Alice. From the North, take the N1 to Bloemfontein, N6 to Queenstown, from Queenstown via Whittlesea, Seymour, Fort Beaufort, Alice, Hogsback. Warning! Do not take the road from Seymour to Hogsback. 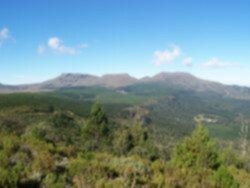 From the East (Kwa-Zulu Natal) N2 via King William's Town to Hogsback. From the South (Cape Town) N2 via Port Elizabeth and Grahamstown, turn off to Fort Beaufort and Alice. No car rental agencies or public transport. For getting around comfortably own transport is recommended. visit Double Drift and Mpofu game parks. Hogsback has 2 small grocery stores, a few shops mainly at the different eateries, arts and crafts, paintings, photography studio and local products like jams, soap and body products azalea nurseries. This page was last edited on 18 September 2016, at 09:15.